Hummus, Mutabal, Riz B Haleeb or Pickled vegetables? 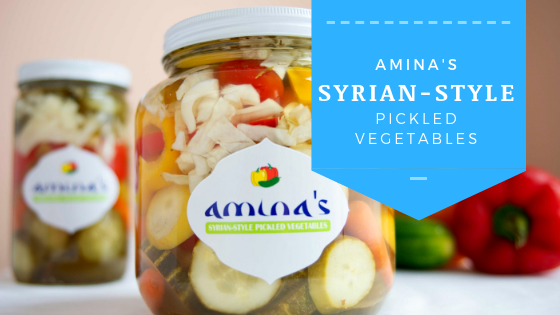 Amina’s pickled vegetables are crunchy and flavored with Syrian spices. Cucumbers, carrots, cabbage, red peppers, green peppers, yellow peppers, water, salt, lemon salt, sugar, vinegar, mint, garlic, Syrian spices. Amina’s hummus is best characterized by its simplicity, there are no other flavors masking the earthy flavor of chickpeas. Tahini adds to the creaminess of this finely pureded dip. Chickpeas, tahini, olive oil, salt, cumin. Amina’s silky mutabal has slight smokey undertones brought by the roasting of the eggplants, which are pureded with tahini. Amina’s Riz B Haleeb is infused with rose flower, and decorated with coconuts shaves and ground pistachio. Rice, sugar, milk, rose water, cinnamon, coconut, pistachio.